Q: My teenage son's room is very small (9-feet-6-inches by 11 feet), but his expectations are very large. In it he wants to put a double bed, a desk, storage space for his clothes as well as other things, and shelves for his stereo, books and basketball trophies. We have moved the furniture innuÂ­merable times, but right now we have it arranged as I have shown. Not only is it very crowded and extremely disorganized, but there's no room for a desk. We're willing to make changes, but don't know what would be an improveÂ­ment. Do you have some ideas that might help us solve this dilemma? A: Quite honestly, with the furniture you presently have, you've done the best that could be done in arranging it. The bed should be placed on the wall you have it on. The only other option would be on the wall opposite that one. There it would be directly in front of the door as you enter the room and you'd be constantly walking around it. It would be too cumbersome. It won't fit anywhere else in the room due to doors and windows. Considering that a double bed is large for such a small room, you've chosen the best option. The chest (even though the door to the closet won't open completely) works best exactly where it is. If you put it at the other side of the bed, it would block the window. If you put it at the foot of the bed, where you currently have the bookcase, it would be even more crowded than it already is. The chest is deeper and higher than the bookcase. As it is, you only have 18 inches of walk space between the bed and the bookcase and as you have already learned, this is not adequate of arranging what you have, and it's still not aesthetic or functional. I would suggest eliminating all the different pieces of furniture and consolidating their various functions into one basic unit. Leave the bed on the present wall, but center it. Put it on a platform base that has drawers that open from both sides for storage underneath. These will serve the function of a dresser and prevent paraphernalia from accumulatÂ­ing under the bed. Centering the bed will leave you with approximately 39 inches of space to the left and the right of the bed. Build enclosed adjustable shelves for additional storage below on either side. These can be used for clothes or whatever else your son chooses to put away behind doors. Above the bed, to the right, I would mount a double "bullet" light. One would be directed toward the bed for reading and the other toward the desk top for studying. 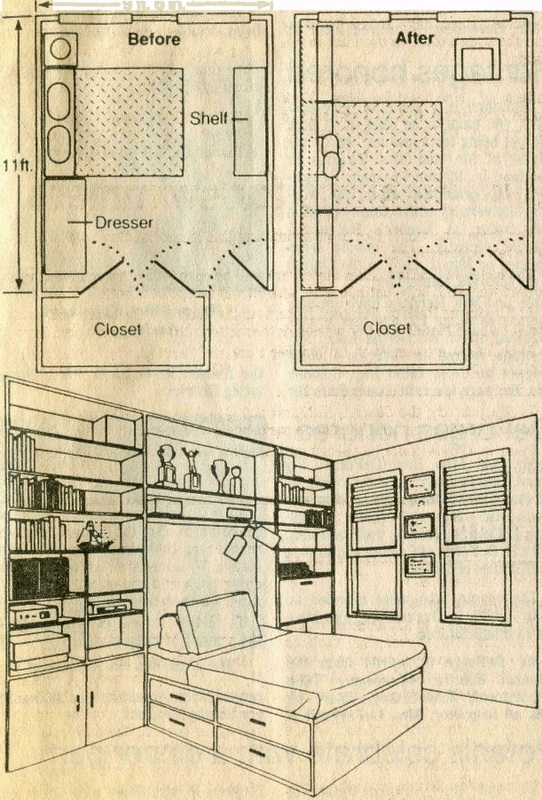 Over the bed and in the remaining space on both sides, I would install adjustable shelves. The less accessible shelves above the bed would hold your son's basketball trophies. The top shelves on either side would be used for displaying things he wants to keep but doesn't use very often. The other shelves can be used for stereo equipment, records, tapes, phoÂ­tographs, books or anything else he desires. By leaving the opposite wall free of furniture, you now have 36 inches of walk space instead of 18 inches. This is more than sufficient. This blank wall would be an ideal spot for grouping all of his posters, and would also help to visually balance the bed and shelves. Use shades or blinds on the windows. They take up less space than draperies, have a clean, neat look, and will help to make the room look larger. 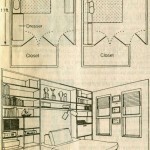 With this plan, you eliminate the-clutter of many pieces of furniture in' the room. I think it accomplishes all you want it to, but is pleasing and doesn't feel crowded. I hope it works for you.